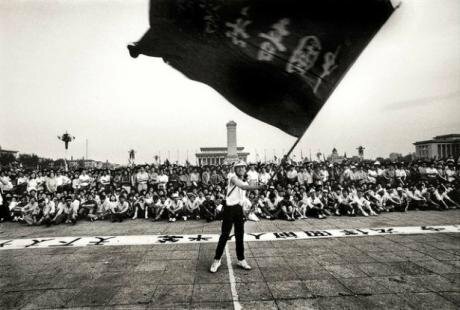 The flag waver in Tiananmen Square in May 1989, before the June 4 crackdown. Flickr/Robert Croma. Some rights reserved. On June 4, Poles celebrate the 25th anniversary of the first free elections since the end of World War II. In 1989, the Polish Solidarity opposition won a landslide, capturing all but one contested seats in both the upper and lower houses of the parliament. This victory led to the appointment of the first non-communist prime minister and a unity government where former political dissidents sat together with their former oppressors. In this powersharing pact the government moved forward to dismantle the Polish communist system and initiate a peaceful democratic transition well before the Berlin Wall came tumbling down and the Soviet Union collapsed. On the same day Poles celebrated the freedom to choose their own representatives to parliament, on the other side of the globe in another communist country, political leaders led a brutal crackdown on the peaceful student protest in Tiananmen Square. According to various estimates, between a thousand and several thousand demonstrators were killed. The Polish opposition was watching the events in China with apprehension, asking itself if their communist partners could turn once again into their oppressors, rejecting the election results and following the example of their Chinese counterparts. The Chinese communist leaders looked in turn with terror at the news from Poland, fearing the “Polish disease” would spread to their land. They were committed to stopping it before it contaminated wider swaths of the Chinese society. As it turned out, the different strategies pursued by these movements were instrumental in determining both the peaceful outcome in Poland and the violent burial of democratic hopes in China. A deliberate strategy of the “self-limiting revolution” drove a 10 million-strong Solidarity movement to its first victory. The popular resistance shook the communist government to its core in 1980, forcing it to legalize the first ever free trade union in the communist bloc. Poland’s self-limiting revolution emphasized the importance of nonviolent discipline within the resistance together with the building of a broad-based coalition of diverse groups in order to wage powerful actions of non-cooperation and disobedience. For a movement as strong as Solidarity, the goal was relatively unassertive. It was not calling for full-fledged democracy; that remained an unfulfilled dream as long as 100,000 Soviet troops were stationed in Poland. Instead, the opposition limited itself by choosing a more concrete and seemingly achievable goal: free trade unions. The tactics were changed from open street demonstrations, which made the protesters vulnerable to repression, to occupational strikes inside the factories. This increased the safety and security of the protesters while making it more difficult for the authorities to disperse the striking workers without first endangering valuable machinery and equipment in the factories. At the same time, the movement with its identifiable and unified leadership emphasized openness to dialogue and negotiations with the communist authorities as long as it was treated as an equal partner at a negotiating table. Their persistent and unwavering adherence to the principles of nonviolent actions and disruptive and constructive organizing, combined with the readiness to talk with the oppressors, led — nine years later — to the round table discussions. They lasted more than two months, between February and April 1989, and gave birth to a political agreement between the opposition and the government that eventually led to the successful democratization of Poland. In contrast to the Polish self-limiting revolution, the Chinese activists pushed immediately for full democratization. This happened despite the fact that the students did not manage to build a broad-based coalition of workers, peasants and intellectuals. With internal divisions among their multiple leadership centers, more radical students were unsatisfied with the concessions offered by the regime. They won free student associations and greater media freedom — and they decided to press on with the demands for genuine democracy in China. This strengthened the hand of the hardliners in the Chinese Communist Politburo that overpowered moderate voices within their own ranks. The students in Tiananmen Square failed to exploit the rifts that existed in the Chinese political leadership as well as apparently serious loyalty problems in the Chinese army. Nonviolent discipline was also shaken when some student groups challenged approaching army units with projectiles. Because of this breakdown, they could hardly stop the soldiers fed the regime’s propaganda about the violent provocateurs. The crackdown followed and the struggle was lost. The core idea of the Polish self-limiting revolution lay also in the understanding that this was a protracted struggle. Solidarity members were convinced that democracy would not come in their lifetime. Nevertheless, they felt they had to wage their struggle then so that their children would live in a free Poland in the future — as distant as it might be. The psychology of the enduring, generation-long struggle helped Poles to remain not only faithful about the eventual outcome but also resilient and disciplined in their nonviolent fight. This collective endurance shaped the strategy of gradually reaching the goals of the resistance and of steadily expanding civic space, one concession at a time. This fortitude was a genuine lesson in strategic patience, grassroots organizing, painstaking coalition building, consensus seeking and dialoguing with the adversary when the opportunity came — all skills that were put into good use in the crucial months of 1989, as well as during the subsequent transition years that followed.